What do the dark universe and the ice core research have in common? According to the Villum Foundation, it is all “about the persons, rather than the project”, when it comes to the 11 grants distributed this year. Excellence, dedication and passion is what Jens’ and Dorthe’s research have in common. As a result, they will now have the opportunity to concentrate fully on what interests them most ­‑ and why not, make their scientific dreams become reality. What are these visions? 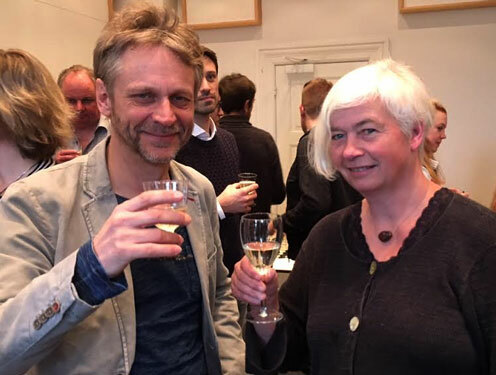 Dorthe Dahl-Jensen and Jens Hjorth from the Niels Bohr Institute obtain nearly 80 million Danish Crowns from the new “VILLUM Investigator” program. Dorthe Dahl-Jensen: The coolest stuff in the “Ice-stream business”! Dorthe Dahl-Jensen’s goal is to obtain better prognostics for sea-level changes by developing Ice-flow and ice stream models on Greenland and Antarctica. The grant is a great opportunity to start new and innovative projects in connection with the EastGRIP ice-camp. A 2500m-deep ice core is currently being drilled through the North-East Greenland Ice-stream (NEGIS). A central aspect of the project is studying the ice stream that is responsible for draining, like a river of ice, parts of the Greenland Ice-Sheet, to further understanding how the ice breaks out like icebergs and how it seems to separate from the surrounding ice. “Improved prognostics about future sea-level changes are critical for society and our future on this planet. From a more personal perspective, this project gives me the opportunity to develop what I regard as the coolest in the Ice-stream research field!” says Dorthe Dahl-Jensen. Dorthe Dahl-Jensen is professor and director of the Center for Ice and Climate at NBI, a research center of excellence focused on Ice core analysis and interpretation of ice-core derived data in a broad, climatic context. Jens Hjorth: recipe for gold? Jens Hjorth’s life work is about answering complex questions such as: What is dark energy? What it is the origin of the heavy elements the Earth is made of? These observational activities will be in strong synergy with Niels Bohr Professor Enrico Ramirez-Ruiz’s new theoretical Center for Transient Astrophysics, which started at the NBI in the spring 2017. The ambition is to create an intellectual powerhouse for new scientific insight and discovery, balanced in gender and expertise, with openness and creativity as the driving forces. “This grant opens up a second to none opportunity to concentrate on exactly the research I have been wanting to carry out: I am interested in finding out whether heavy elements such as gold and solids – based on for example silicon and carbon, which the Earth is composed of – are created by violent explosions in the Universe”, says Jens Hjorth. Jens Hjorth is professor and leader of the Dark Cosmology Centre at NBI, which gathers world experts to work on the answers to some of the most intriguing questions of our time, such as: what is dark energy and dark matter? When were stars and black holes created? What is cosmic dust?